Laura Ling, a Chinese American TV journalist, became world-famous when she became the subject of the news herself -- as a prisoner in North Korea. The entire world watched as she and her colleague, Euna Lee, were the first Americans to be sentenced to a North Korean prison camp. I personally remember this because she is my cousin. It was a frightening time for us all. 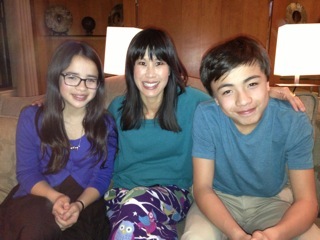 Recently, Laura Ling has been in the San Francisco Bay area speaking about the time she spent detained for five months in North Korea in 2009. I attended one of these talks and learned even more about her and her captivity. Laura grew up in Carmichael, California, just outside Sacramento, and shared what it was like to be one of just a handful of Asians at her public high school. (She attended high school just before the diversity of cities in California began to rise.) Laura commented, "I just felt different, and uncomfortable in my own skin." But it was also in high school where she found a passion for journalism. "My escape was writing," she said, "I wrote for my school paper and felt like I could have a real impact by informing my peers about what was happening in their world." When she graduated from UCLA, Laura continued with her dream of being a journalist. Over the years she has reported on stories from around the world, including slave labor in the Amazon, the humanitarian crisis in Haiti, and the challenges faced by military families here in the US. She was the vice president of Current TV's journalism unit and created its award winning documentary series, Vanguard. After much success working in television news, she became the subject of the news herself! When on assignment on the China-North Korean border reporting on the trafficking of North Korean women, Laura and Euna were captured by North Korean guards and held captive. She was interrogated daily and became the first American to be tried and sentenced to 12 years of labor camp. Luckily, her sister, Lisa Ling, a highly connected journalist, who works closely with Oprah Winfrey, worked to get her released by Bill Clinton. Attending the talks Laura hosted, we had the chance to catch up. I was happy that the trauma of being held in North Korea did not keep her from moving ahead with her life. She and her husband now have a little girl. She also has an exciting job hosting a documentary series called E! Investigates on E! Entertainment. She is very happy despite all that she has been through. ...and she has remarkable stories to share. When Laura was in captivity, communications with her was almost impossible. However, North Korea allowed us to send letters. The route these letters took reflects the fact that there is no direct communication permitted between North Korea and the US. We would forward our emails to Laura's mom. They were sent to the Swedish ambassador in North Korea who would then print and deliver them to the foreign ministry office, and they would finally make their way to Laura. So important were those letters that she memorized each one! She also hand carried them with her on the plane ride home with President Clinton. We had been watching the news clips very carefully on TV, trying to figure out what she was clutching in her arms as she walked off the plane. When we asked, she explained that she was carrying the only two things she wanted to take back: (1) her stack of letters, her most precious possession; and (2) the uniform shirt they had made her wear during her trial. "It's a reminder of the time I thought I might never get to see my family again," she said. "Now I feel I have a second chance and I look at each day with immense gratitude. I hope to learn more of Laura's stories over the years. For now, she gets to spread them through her book, Somewhere Inside: One Sister's Captivity in North Korean & the Other's Fight to Bring Her Home, and the talks she gives. I hope to spend time just being her cousin and getting to know her, her family and their cute daughter... to be family. And family is what's most important to Laura. While she juggles time working as a television reporter on various projects, she considers her most important job being a mom. "I look at each day with my daughter as an incredible blessing," said Laura. "I want to do things that have meaning. I want to make my little girl proud." We got together in January 2007 to celebrate Laura's dad's 70th at a hot pot restaurant on Clement Street in SF. 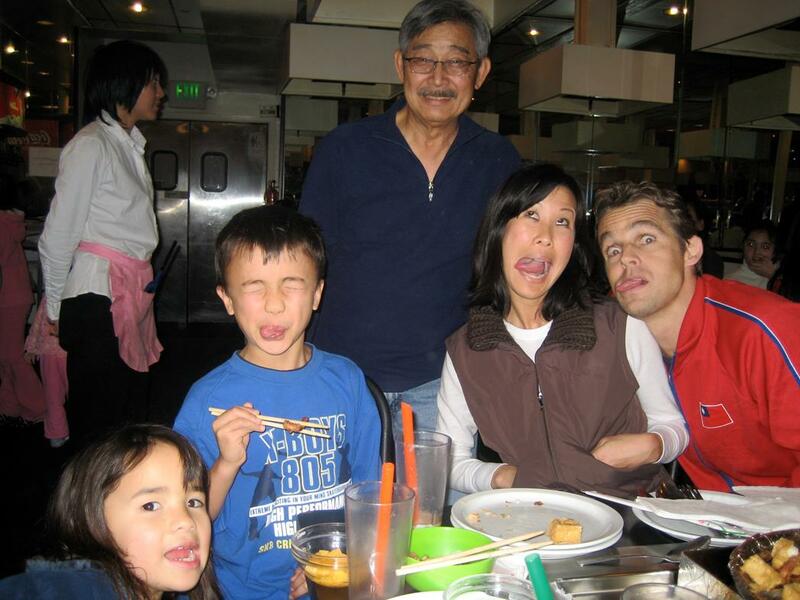 (Emeline Kao, age 6, Jackson, age 8, Laura Ling, her husband Iian and her dad, Doug Ling.) Laura and her family always make us laugh!